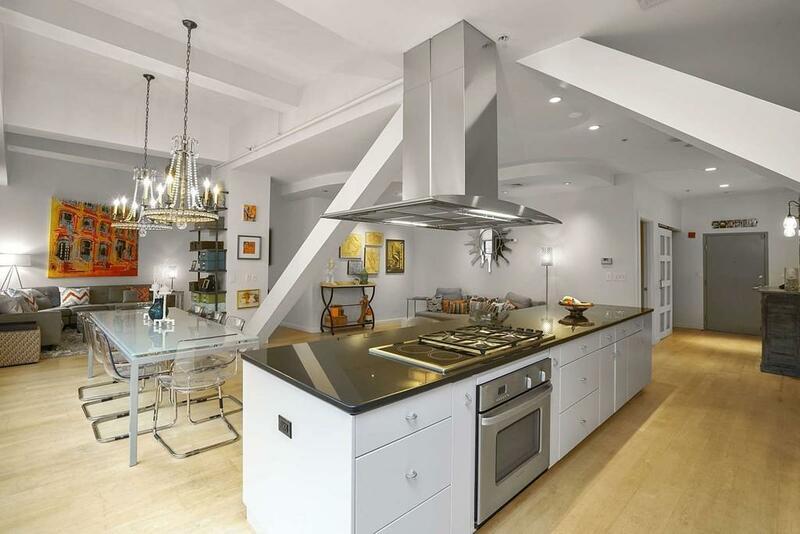 In the heart of vibrant South End's SOWA district, close to Whole Foods/Ink Block, this exceptional 2116 square foot open-concept loft is in a private corner of Laconia Lofts bldg. The sundrenched 3bed/2bath home showcases a wall of windows, gleaming maple floors, towering 12-ft ceilings, and dramatic chef's kitchen with 15-ft granite island, stainless steel appliances, and 6-burner gas/electric cooktop. Huge closets with custom doors and built-ins. King-sized master bedroom has three closets, including lg walk-in. 18âx18â corner 2nd BR and flexible 3rd room perfect for guestroom/den/office. Both bathrooms were remodeled a year ago with Porcelanosa tile, Restoration Hardware vanities, and rainhead showers. Master bath has heated floors. Deeded garage parking, new in-unit Bosch washer/dryer, elevator access to common roof deck with grill and panoramic views and walk-in storage closet complete the package in this professionally managed building. Wired for music/surround sound.